In Gaelic the word heather is rendered "fraoch"--which has in turns become the name of a beer and shorthand for the brewery that produces it. That company began in 1986 in a Glaswegian homebrew shop, when a customer brought in an old family recipe for "Leann (ale) fraoich" (no word on what happened to the "i"). The owner, Bruce Williams, then went on a crusade to bring back the historic beers of Scotland. With his brother Scott, he first began to brew at the Maclay & Co. Brewery during heather season before the brothers ultimately got their own brewery in 2000. They relocated in 2005 to a larger brewery. 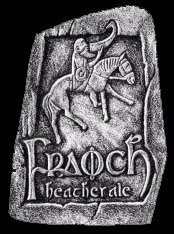 And yet, although the company produces four additional historic brews, it is still known by its earliest incarnation: Fraoch. I've had a couple of bottles recently, and am finally getting the reviews posted. In addition to these two, the brewery also produces Grozet (a gooseberry ale), Alba (spruce and pine), and Kelpie (with, I kid you not, seaweed). The company claims that heather ale is the oldest style of ale still produced in the world, and who's to argue? We know of earlier Egyptian recipes, and the Williams Brothers don't actually have the 4,000-year-old Scottish version. But still--what's a little PR among beer geeks. What they have produced is a barley-based beer with botanicals--principally heather--in place of hops. Also added is sweet gale (related to bayberry), which is actually bitter and itself a historical additive, having been used in a Yorkshire brew (known, not surprisingly, as "Gale beer"). From aroma to aftertaste, this is a disorienting beer. Nosing around, you might think you're picking up notes of pine or mint (the gale?). In your mouth, your tongue keeps instinctively waiting for the hops to kick in, and when they don't you expect to be left with a cloying sweetness after swallowing. It looks like a normal beer: a sort of nondescript amber with a nice head. It even, the further you get along in a pint, tastes like a beer. But the palate does disorient. Fraoch doesn't get treacly, and yet you never identify a source of bitterness that might offset it. Somehow the sweet gale and heather used to spice the beer balances the malt. It's ... herbal. One note: it tastes weird the first four or five (dozen?) sips. Perservere. Much as with Craig Nicholl's Burghead Heather ale, Fraoch comes around. I find the palate both soft and substantial and strangely thirst-quenching. By the end of the bottle, ten to one says you'll be enjoying it--if not understanding why. Introduced to Scotland by Welsh druids in the 9th Century, elderberry black ale was part of the Celtic Autumn festivals when the "elders" would make this strong ale and pass the drink round the people of the village. The recipe was taken from a 16th Century record of domestic drinking in the Scottish Highlands. As labeled, Ebulum is black and sports a toffee head. The aroma is herbal tending toward medicinal, but with a more traditional British yeast note. It is a deliciously rich and creamy ale, and fairly beery--although interesting new flavors abound, you're on more familiar footing here. The elderberries are rooty more than sweet, and they contribute a strange astringency that seems like it's anesthetizing your tongue. Of course, it doesn't. Elderberries apparently contain a host of compounds, and these contribute a flavor that seems like it includes more than one additive. (There is no fruit flavor.) It is a fascinating, lovely beer, and I envy the Scots who can go have a pint at the pub.